SVR Hydraliane Rich Intense Moisturising Cream 40ml is an intense moisturizing cream which is suitable for the normal to dry skin. This cream provides to your skin a comfort and a long-life moisturizing up to 24h. It contains high level dermatologic ingredients as Physio-adapted water which infuses in continue on the skin the water essential to cells. It contains also physiological sugars which allow to fix durably the water in the skin. Its non-greasy, rich and silky texture covers your skin of a sublime velour finish. Formulated with paraben-free. Non comedogenic. Hypoallergenic. SVR Hydraliane Essence Hydrating Concentrate 75ml Free with aqua-gel texture is an ideal solution to moisturize all skin types, even sensitive ones. First care gesture for intense hydration, its formula contains physio-adapted water 80% + hyaluronic acid. Hyaluronic acid is plumping and fixes water durably to form a surface protective film. The skin is fresh and full of water, ready to receive the following care. SVR Hydraliane Rich Intense Moisturising Cream 40ml: Apply to the face and neck morning and/or evening. Excellent make-up base. SVR Hydraliane Essence Hydrating Concentrate 75ml Free : Apply morning and / or evening on clean skin, under the serum or under the care. Indication: Rich moisturizing cream, face. 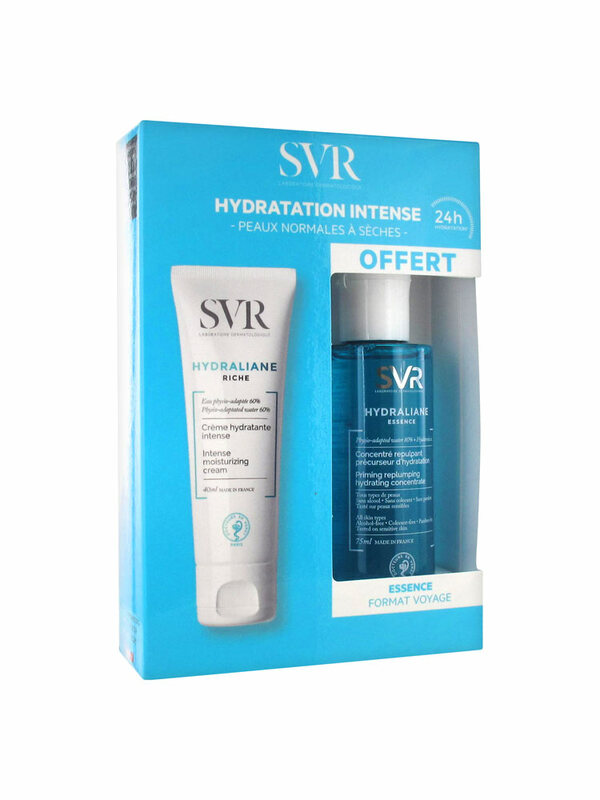 SVR Hydraliane Riche Crème Hydratante Intense 40 ml : Aqua (Purified Water), Propanediol, Cyclopentasiloxane, Caprylic/Capric Triglyceride, Corn Starch Modified, Dimethicone, Glycerin, Butyrospermum Parkii (Shea Butter), Glyceryl Stearate, Cetyl Alcohol, Magnesium Gluconate, Manganese Gluconate, Saccharide Isomerate, Squalane, 1,2 Hexanediol, Arachidyl Alcohol, Arachidyl Glycoside, Behenyl Alcohol, C12-16 Alcohols, Ceteth-20, Citric Acid Hydrogenated Lecithin, Hydroxyethyl Acrylate/Sodium Acryloyldimethyl Taurate Copolymer, Palmitic Acid, Peg-75 Stearate, Polyacrylate, Crosspolymer-6, Polysorbate-60, Sodium Citrate, Sodium Lactate, Sorbitan Isostearate, Steareth-20, Xanthan Gum, Chlorphenesin, O-Cymen-5-Ol, Parfum (Fragrance). SVR Hydraliane Essence Concentré Repulpant 75 ml Offert : Aqua (Purified Water), Propanediol, Glycerin, Magnesium Gluconate, Manganese Gluconate, Zinc Gluconate, Peg-60 Hydrogenated Castor Oil, Polyglyceryl-7 Glyceryl Cocoate, Tamarindus Indica Seed Gum, Saccharide Isomerate, Sodium Hyaluronate, 1-2 Hexanediol, Citric Acid, Pentylene Glycol, Sodium Citrate, Sodium Lactate, Sodium Benzoate, Parfum (Fragrance).